"Stepping into the Future for a Sickle Cell Cure"
the Greenwich to New Haven areas. 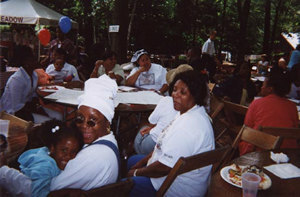 This photo was taken after The Southern Regional Sickle Cell's 1st. Annual Celebrity Basketball game. 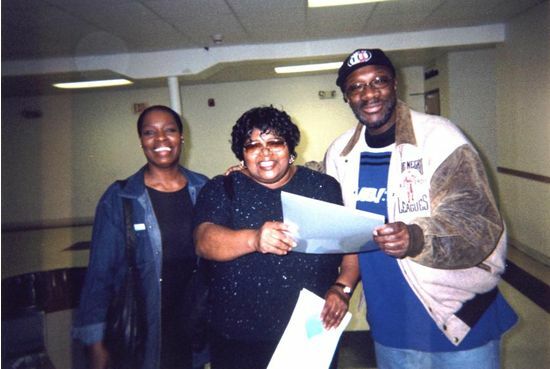 In the photo is Sandra Worrell, Board Chair for the Association, Isaac Hayes, and Delores Williams-Edwards, Executive Director. The Southern Regional Sickle Cell All-stars played against the Isaac Hayes Crusaders on February 3, 2001, in Bridgeport, Connecticut . Isaac Hayes attended to watch his team play our team. After the game we gave a reception in his honor. We thank Isaac Hayes and his foundation for all their support.